For the professional user involved in routine water quality monitoring. For the titrimetric determination of various water quality parameters. 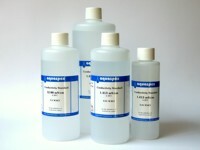 Various solutions for cleaning and storage of pH electrodes. For the titrimetric determination of various parameters. Buffers for the conditioning of water samples for subsequent testing. Standard solutions made on request. Reference solutions for various purposes, e.g. calibration of instruments.